Jeff Goldblum is currently out promoting Jurassic World 2 and he is often asked whether or not his Grandmaster character survived Infinity War. Not only does the actor reveal that he did, but he also states that you can't kill him. Goldblum likened himself to an MCU vampire who can kill and bring others back to life. He had this to say. "Grandmaster is more superheroed than all of them put together. You can't kill me, I'm like a vampire... I'm deathless and I can kill people by looking at them. Or I can resurrect them just by looking at them and thinking of them. I can do everything. Being able to do all of that, all I want to do is play games. So really, I'm everywhere and nowhere. I'm like Keyser Soze." Jeff Goldblum is obviously having a bit of fun with the interviewer, but it is likely that Grandmaster is still alive in a universe with half as many people. And while Goldblum may be having some fun, he knows the history of the Grandmaster. His character is an elder of the galaxy and is considered a virtual immortal survivor. He is one of the last of the first intelligent races after the Big Bang. Jeff Goldblum's words echo the truth about Grandmaster. The Grandmaster is interested in playing games, especially games with high stakes, which is seen in Thor: Ragnarok. He enjoys collecting, like his brother, but only for tournaments and games. And as for his powers, Grandmaster does have the power to resurrect mortals, but not others who are considered to be close to immortal. It's possible, but unlikely, that Jeff Goldblum could make an appearance in Avengers 4 to possibly help bring some people back from the dust bowl at the end of Infinity War. 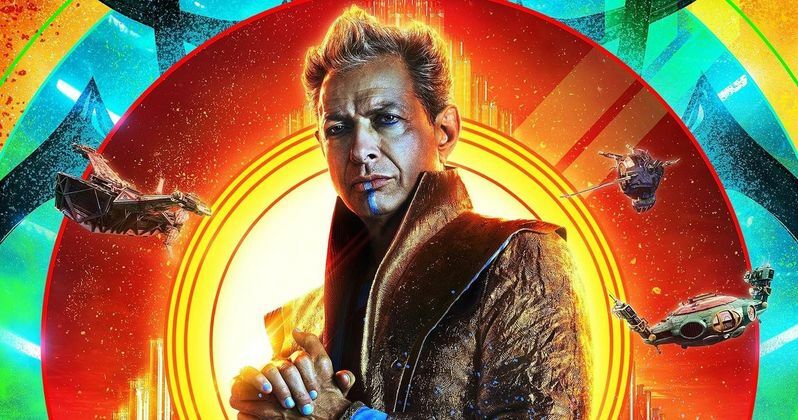 Add Grandmaster to the list of survivors from Infinity War and possibly outlasting everybody within the Marvel Cinematic Universe as well. As far as casting goes, one could not have picked a better actor than Jeff Goldblum to take on that role. Let's hope that he shows up at some point down the line again in a future MCU film. For now, you can go see Goldblum on the big screen in a few weeks when Jurassic World 2 opens on June 22nd. And while you wait for that, you can head over to Digital Spy to see the rest of the interview with Jeff Goldblum.